It is just the realization that our consciousness is connected to higher realms, non-physical planes of higher and more positive vibration, and that we can bring those positive vibrations, that love into this world with focused intent, through the sacred space of the heart - what I call the Heartspace Portal. The philosophy of Quantum Love is that this divine love is an alchemical power which we humans can use to positively transform our individual lives. And by doing so, will automatically change the entire world for the better via the Bhodisattva effect. We can all live a life filled with love, peace and harmony, as soon as we realize that we are the ones we are waiting for, that we can all co-create a better reality using our capacity for compassion, empathy, caring and community. Unconditional love is an attitude, a good and necessary one. While divine love is a resource, it's the unique gift that humans can transmute this reality with, it's how we can bring heaven to earth, NOW. theories, ideas and facts. This really is leading us to finally solving the riddle of creation, that the all unifying force is consciousness itself. Click here to read more more about the paradox of being. I wrote a column for several years called "Metaphysical View" for Intrepid Magazine. Ideas and theories from today's most open minded, progressive, free thinking writers, regarding all aspects of the Archaic Revival, Science, Politics, Metaphysics, Meta-Science, Culture, Conspiracy Theories and Unexplained Phenomenon. 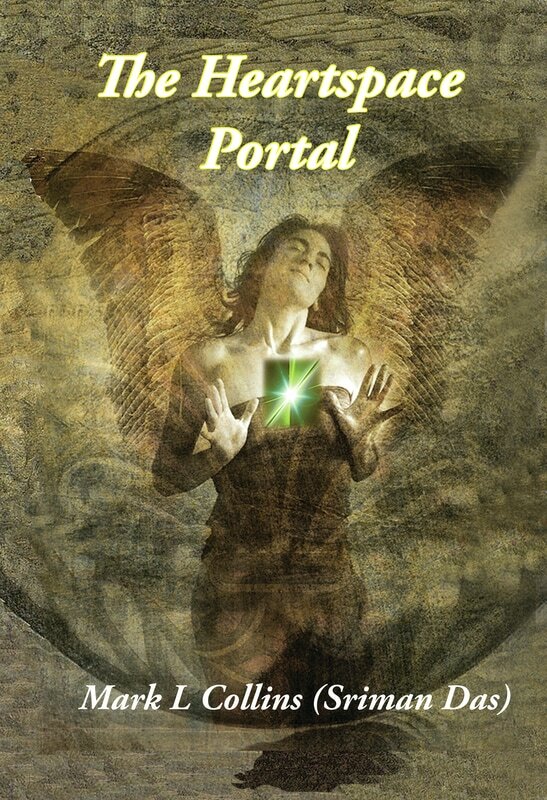 The Heartspace Portal Book is about connecting with your higher self via the sacred space of the heart. Through peaceful meditation you can merge with an omniscient, omnipresent awareness which lives beyond time and space. This consciousness, that exists separate from your body/mind is what you really are. It connects all sentient beings in the cosmos, and is also the ground of being for our entire temporal reality. With this realization you can begin to love yourself while experiencing true oneness, acceptance, peace and love with all creation. You must awaken the Heart Chakra to access the divine love of creator that lives within. ​Hello! I am a writer, healer, and teacher of all matters metaphysical. My spiritual name, Sriman Das, means: "he who serves the mother of the world". There is a great need in today's society to balance our God image, by recognizing and honoring what yogi's call the Shakti energy (the power of divine mother). In the last few thousand years, patriarchal belief systems have served to support the prevailing materialist view of reality. However, materialism is being challenged by newer ideas of science, which is clearly showing that the base core of reality is not inert, but rather responsive, vibrant and alive. When you start to view the fabric of reality as being a creative, life supporting field of infinite possibility, it changes your entire outlook on life to the positive. We all know there has been something missing from a strictly material view, that something is LOVE. Scientifically, what we know as the Quantum Superstring could really be interpreted as the Shakti force, a divine energy from which our manifest reality springs. Shakti is the Formless field, Shiva is the Formed. This idea allows for a duality of awareness, recognizing the idea that hidden dimensions are forming this one, and that the physical universe is but a reflection of subtle, unmanifest worlds, planes or levels of existence. Taking a more balanced view of the Godhead, we then realize that heavenly mother is the key to healing and balancing our entire civilization, for she opens us to a heart based consciousness. Whether you are a man or woman makes no difference, for we all benefit when we balance this God/Goddess polarity within ourselves. When we quiet the mind, and open our hearts, we can then hear the voice of the soul (Atma), the spirit, the higher self. We all really have two awareness's, the body/mind and the soul. Happiness and fulfillment can only be found when we leave the mindspace, enter the heartspace, and listen to the voice of the soul or spirit within. Love God/Goddess, love self, love all. ​​The first peace, which is the most important, is that which comes within the souls of people when they realize their relationship, their oneness, with the universe and all its powers. This first peace comes when people realize that at the center of the universe dwells Wakan Tanka (the Holy One or the Great Spirit in Lakota, or Sioux), and this center is really everywhere; it is within each of us. ONE IDEA, ONE GOAL: To spread the message of Quantum Love through radio, seminars, and books on metaphysical spirituality and heart based , unity consciousnness. To share insights on spiritual metaphysics gained from experience with meditative yoga, energy healing, the study of spiritual paths, religious systems, and quantum physics along with philosophic reflection on the ultimately ubiquitous phenomenon we call consciousness. The way to bring Quantum Love into the world is to enter a heart based, meditative consciousness. In my book, The Heartspace Portal, I offer ideas and techniques that bring you into the realization of the oneness of all life, a remembrance of our connection to an absolute reality beyond this one, and an awareness that we are all part of one, undivided, all pervasive consciousness. Quantum Love is a philosophy - That by loving the foundational source of all creation we can automatically enter into unity consciousness, which in turn allows us to co-create a new, positive, Utopian reality, together, by bringing divine love into the world via the sacred space of the heart. As above, so below, as within, so without.